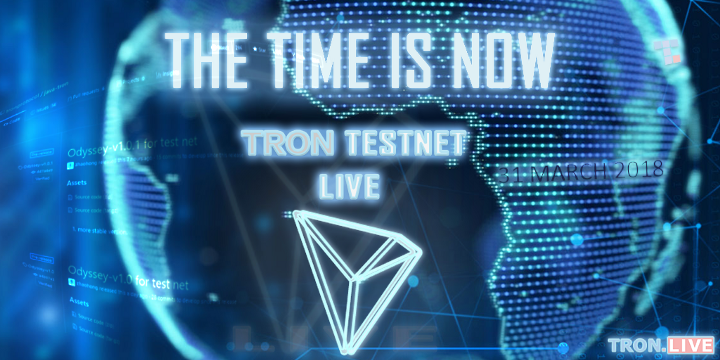 TRON testnet was officially launched on March 31, 2018 and TRON made two live streams on the day explaining the technical details of the testnet. In this article, TronLive have compiled the information and made an overview of the first live stream where Justin Sun brief of on the current status of TRON and introduced the testnet to the audience. TRON team has increased to 100 people; most of them from Alibaba, Tencent, Amazon; all giant internet companies and they are moving from centralized companies to company that supports decentralization. TRON is now listed on 37 crypto exchanges and have 7 fiat trading pairs. TRON expect to launch in majority of the mainstream exchanges in the future. TRON also plans to have more fiat trading pairs instead of crypto-to-crypto trading pairs. They aims to stay in the top 10 position for cryptocurrency in the future. For the past three months’ development, TRON already have half a million token holders and millions of supporters. 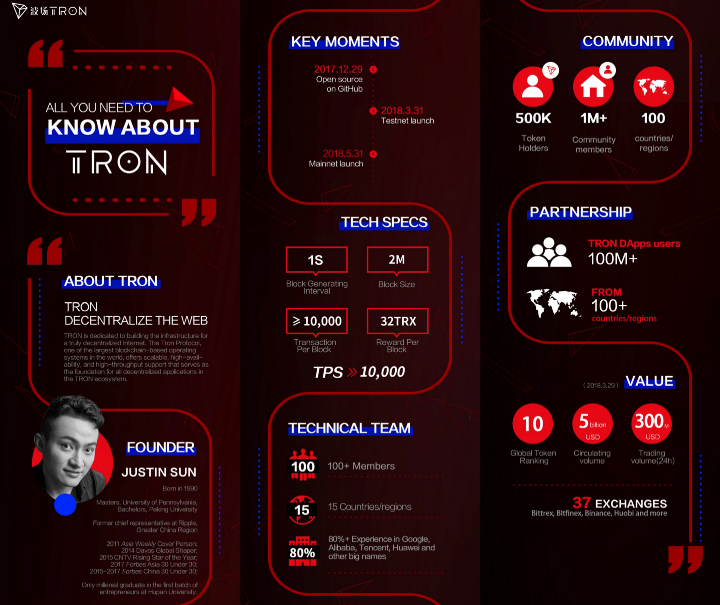 TRON is one of the cryptocurrency with the largest crypto communities in the world. When supporters get to know Tron in September last year, most think TRON is just a decentralized entertainment protocol. 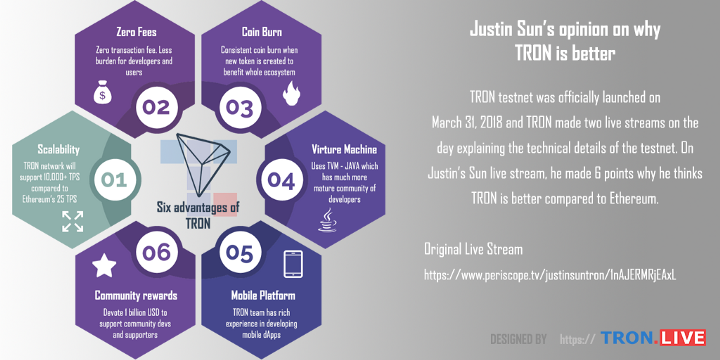 Justin clarified that TRON is not just an entertainment protocol. Entertainment, including gaming, online gambling and online entertainment will be the first use case of the its blockchain, but TRON’s vision is to decentralize the web itself. Justin talked about the recent #deletefacebook campaign and mentioned that Facebook, Google, Amazon, Netflix are all giant companies that control and own user’s data, and can manipulate users into getting the results they want. This is not how the internet used to be and we should give the data back to user’s own control. TRON wants to become blockchain decentralized app (dAapp) platform with the largest user base in the world. Tron network will offer scalability, high availability and high throughput support for all the decentralized applications in the network to achieve that. In the future, TRON will compete with Ethereum as a dApp platform. They have the confidence to build a much larger ecosystem than Ethereum. Justin is very grateful for Ethereum for supporting TRON for the last six months and they benefited a lot from Ethereum. So, TRON will launch an airdrop for Ethereum users in the coming quarter (The specific airdrop details and exchange are not confirmed). For the next quarter, majority of TRON’s job is to migrate from the Ethereum platform to the TRON’s own network. TRON will also have the current dApps migrate from Etheruem to the Tron network. TRON already have 100 million users on their dApps (Peiwo, Obike, Uplive, Game.com, Kitty live, Bit Guild, Trip.io, and Mico), and they will migrate all the dApps to their own network. Justin stressed on six points that why he thinks TRON is better compared to Ethereum. TRON will provide high computing power and a superior consensus mechanism to guarantee high TPS. Transactions can be fast enough for daily, small amount transfers. Provides very strong support for dApps instead of causing of traffic jams in protocol. Provides support for more sophisticated smart contracts and more promising dApps which will benefit the whole ecosystem. Ethereum cost is $0.02 for every transaction, which will increase in the future if the ETH price increases. This is a very heavy burden for developers and users. With zero transactions fee, every dApp can easily make full use of the TRON protocol which will be more convenient than Ethereum and any other dApp platform. TRX will have consistent coin burn vs ETH unlimited supply. With consistent coin burn and limited supply, there will be more advantages. Tron allows every individual to issue own digital assets under protection of protocol. The cost to issue a new token on the Tron protocol is 1024 TRX. This cost of creating token will be burned completely. The more developers launch applications and issue new digital assets, more TRX will be burned — benefit whole ecosystem. Before January 21, 2021, Tron Foundation will be responsible for the reward for blocks and TRON will not increase supply of TRX. Java is more popular and has much more mature community of developers than solidity. Tron is defined with google protobuf, which is natively extensible. 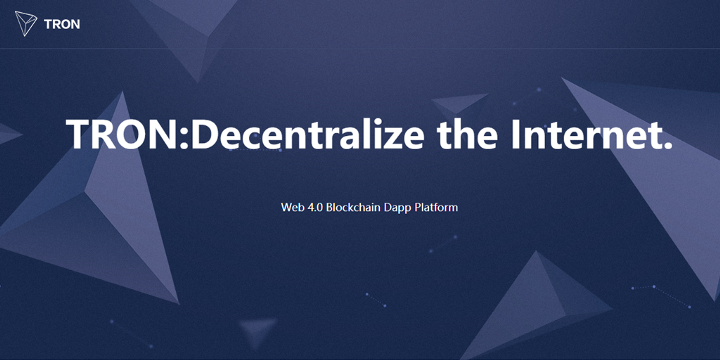 Developers can easily use Application Programming Interface (API) for powerful dApps and customized wallets. In contrast, Ethereum EVM is constrained in complexity and extensibility. TRON team has rich experience in developing the Peiwo app, so they already have the experience supporting 30 millions users back in the mobile age of development. TRON knows how to support the developers with a high availability and high throughput environment. And that is why they have already partnered with dApps providers with total of 100 million users. When Mainnet launched on May 31st, TRON’s partners dApps will migrate onto the Tron Network which will bring those users into the ecosystem. TRON will be more mobile friendly because they know mobile users are the majority of internet users right now. TRON will devote 1 billion USD to support community developers and supporters to make TRON grow further. Justin also gave some hints on some technical details of the testnet. 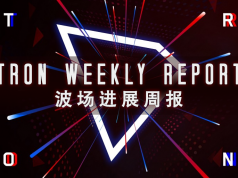 The topic is further covered in TRON technical team’s live stream. TRON will also have elections for the nodes in the TRON protocol. Every supporter and developer can run nodes in TRON protocol to validate the ledger. TRON supporters and developers can run nodes for protocol and get block rewards from running the nodes. Delegates (nodes) will be elected by the community by TRX (1 TRX = one vote, can vote as many times as you want within a 24 hr period. More info in tech live stream). The community elects Delegates, Delegates will validate the ledger and get rewards. Every TRX matters, because we can use it to improve the governance of the TRON Protocol. From this perspective, the TRX token is very important because we can use TRX to decide the distribution of the resources of the TRON Protocol. So, every TRX matters. 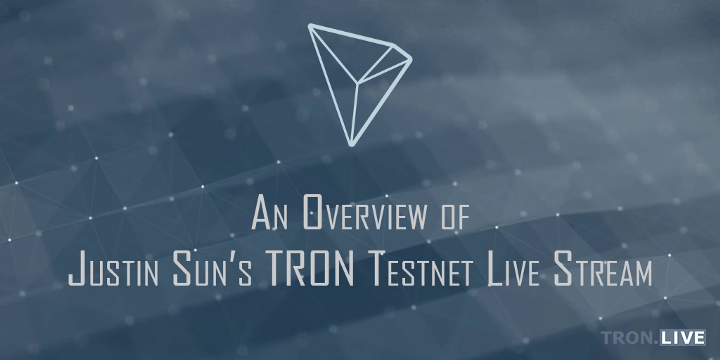 That’s all for the overview of the March 31 TRON testnet live stream. If you like our work, make sure to support us by following our Twitter and newly created YouTube channel. Thanks!